Photos date from March, 2004 onward; most are scanned from 35mm prints. Admittedly, the Farwell didn't look terribly interesting from the outside (nor incredibly savory), but we were in for an awesome, Fabergé-egg-esque surprise. 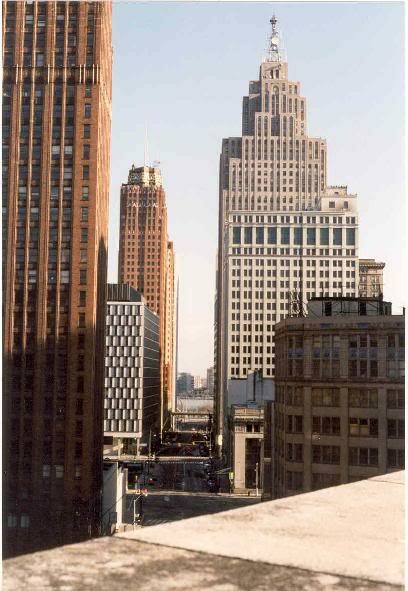 Back then, unless there was a sports event, we were the only people on the streets in all of downtown, besides Papa Smurf (Papa Smurf was a fairly jovial homeless guy who had a white beard that made him look like, well, Papa Smurf, and who hung out behind the Farwell). A quick peek inside the AIA Guide to Detroit Architecture shows that the Chicago-style Farwell Building was designed in 1915 by the noted firm of Bonnah & Chaffee, to a height of eight stories, and stares blankly across the park at Albert Kahn's Griswold Building. 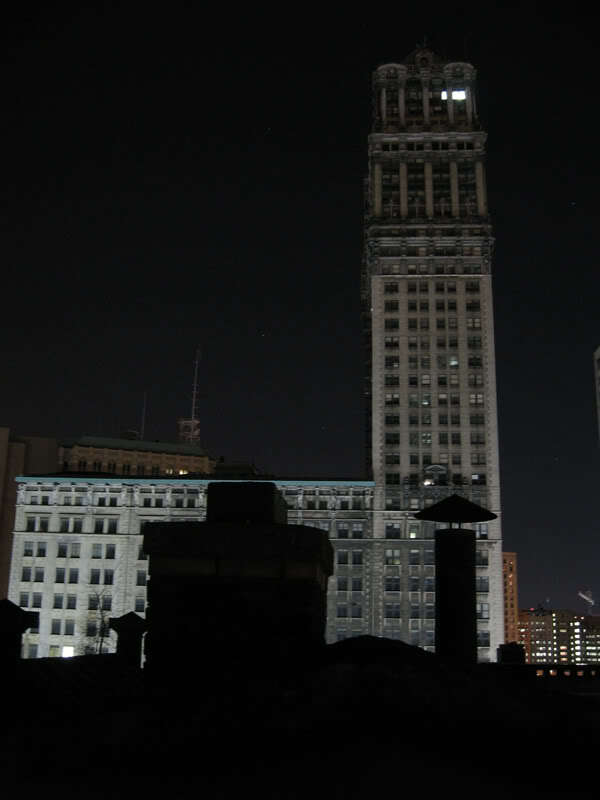 Bonnah & Chaffee were also responsible for the Lawyers’ Building, and a few other towers on Cadillac Square. 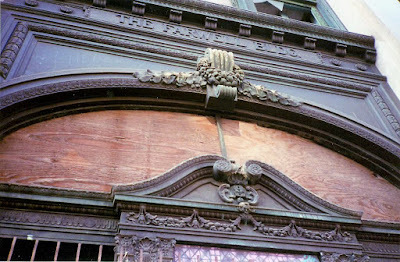 That photo above depicts the front of the Farwell in 1976 or so, from the DUCP photo collection. 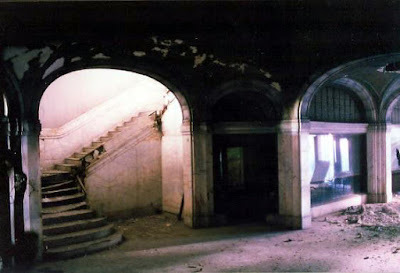 The next photo below shows the lobby in its heyday. 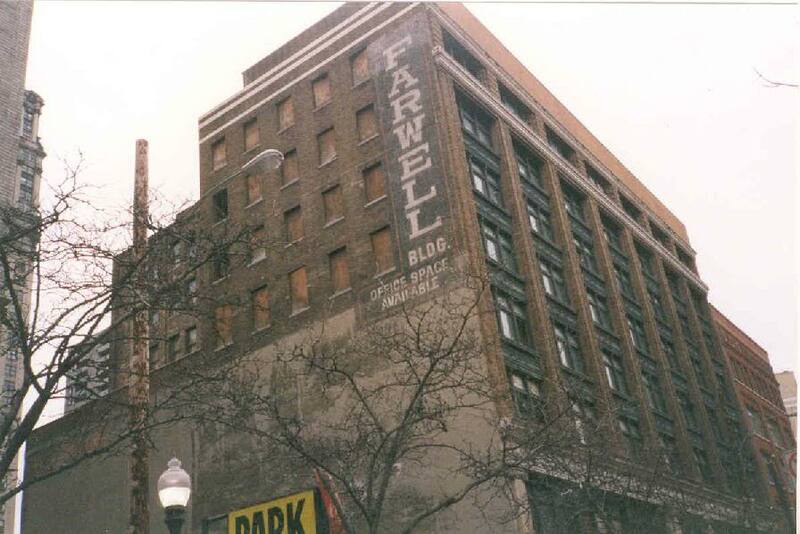 Downtown veteran David Kohrman points out that the Farwell was one of the many "speculative" office buildings erected in Detroit during its boom days. 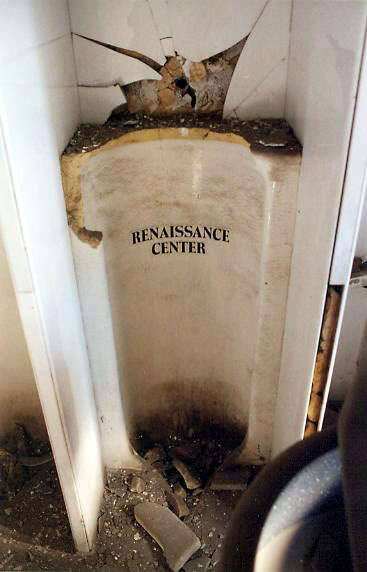 This merely means that it was built by a private investor who did not actually have a company to put in said building, but expected that one would come along and lease it, due to high market demand for space. 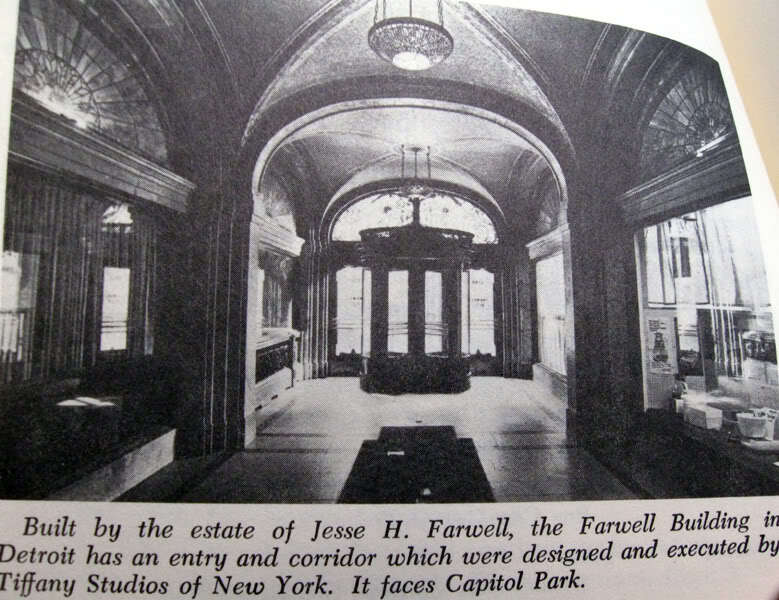 George Farwell, the son of Jesse H. Farwell was the investor who founded this building on behalf of his father's estate. According to the Freep's "Dirty Dozen" list, Mike Higgins, owner of the Farwell, had been cited for violations involving falling glass and mortar. 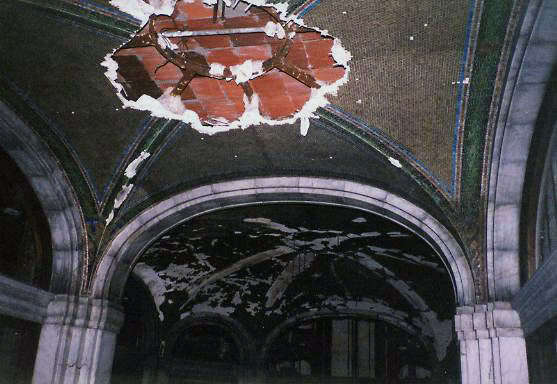 The building has been closed since 1984 according to author Jack Dempsey. 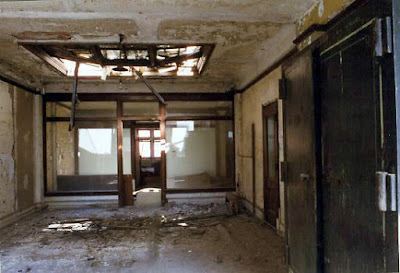 When we got in, the main floor was utterly dark, due to the only windows on the front of the place being boarded. The lobby was incredible...vaulted Romanesque ceilings created a strange reverberant effect on our footsteps, and were mosaic-tiled in sapphire- and pearl-hued Tiffany glass, accented by gold flakes. 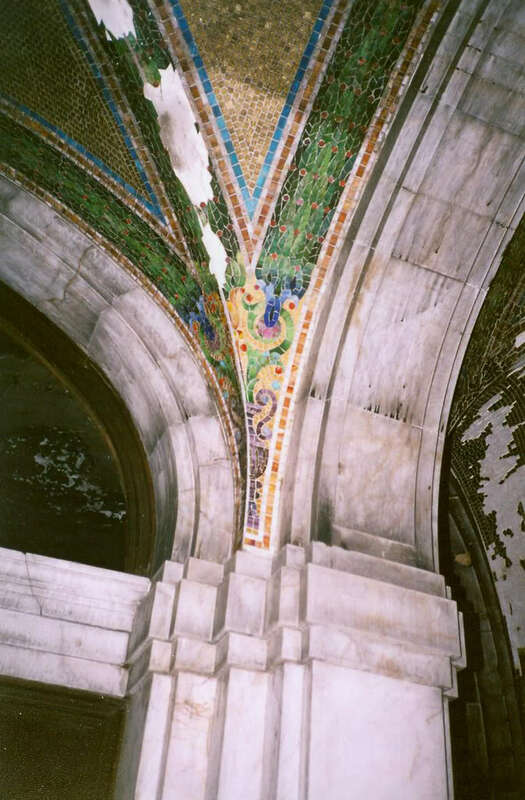 Here, you can see the Tiffany-glass mosaics on the ceilings a little better. The actual Tiffany windows (that you can see in the lunette transoms in the historic photo above) were missing however, possibly pawned long ago by Mr. Higgins to pay the light bill. 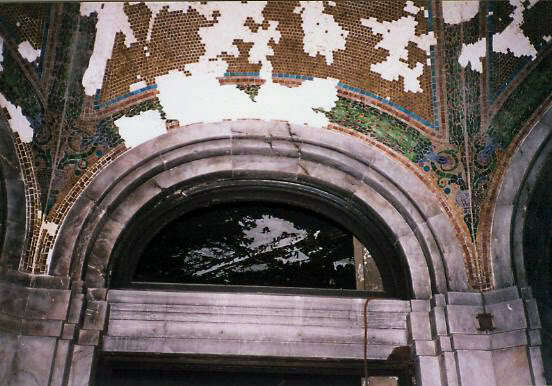 Legend has it, as Detroitblog recounted, that these windows and mosaics were assembled under the direction of Louis Comfort Tiffany himself. I rooted around on the floor for a good sample of the fallen glass squares to take back to the lab for analysis. This was one time that a flash didn't ruin the shot. 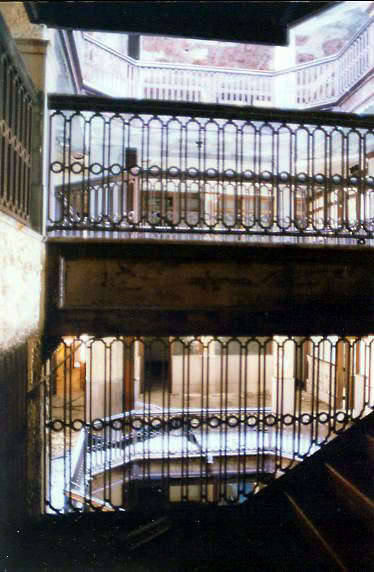 A wide marble staircase curved up from the atrium to the second floor, where the banister turned from nonexistent to elegant wrought bronze. 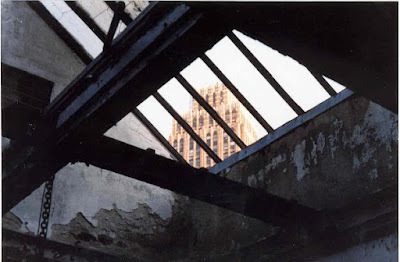 There light spilled in through the building's huge five-foot-wide windows and the glass walls of the shops and offices in the hall. This is when we noticed the Farwell's light-well, which we were now standing at the bottom of. 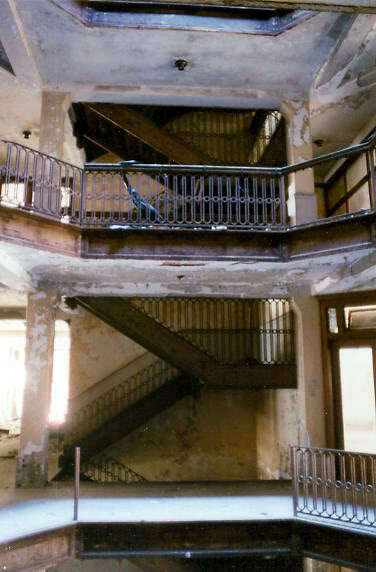 Look how comparatively clean it was in there back then...the building actually looks salvageable. The walls were all still faced in rich polished Grecian marble, and the elevator doors were glass, framed in ornately worked bronze. 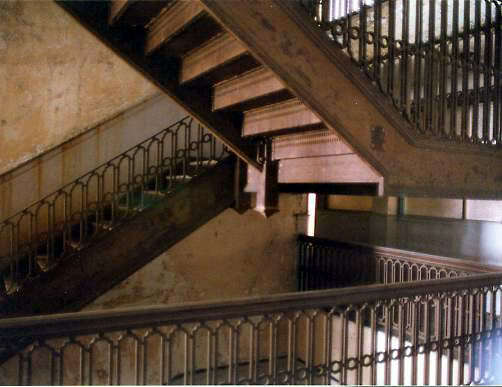 The railing around the light-well was the same decorative bronze as the staircase banister. David Kohrman wrote that the well-known Detroit firm, Russell Wheel & Foundry, had also provided some work on the interior appointments of the building. The foundry was mostly known for manufacturing logging railroad cars and logging implements, but later turned to structural steel work such as that found in lighthouses. The rest of this floor was awfully cluttered and smelled slightly of garbage. Much of it was grimy clothing and food wrappers. The weather was actually starting to sort of feel like springtime, and most of the snow and ice had melted. 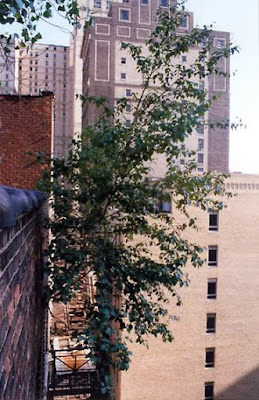 This meant that the severely damaged Farwell was raining water in huge sheets down the side of the building, and it was also leaking inside. 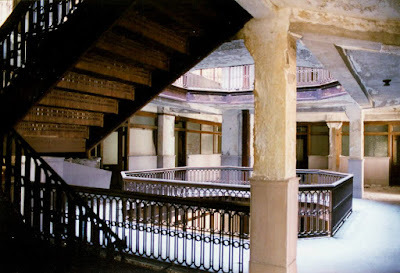 The upper floors were buried in rotten plaster dust. There were also some choice heaps of garbage, sizeable enough to fill multiple dumpsters, indicating that this once was a homeless hotel for some time. The marble walls were stained with filth where—depending on the height of the splatter—a person had either vomited or leaned against it to unleash a heroin-induced shitsplosion. 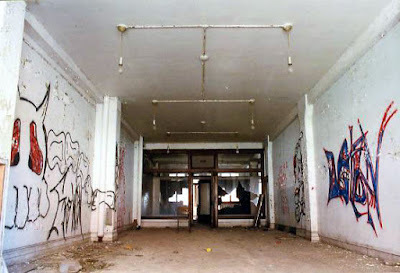 On one of the floors in the atrium area, there was a tag written by a duo of explorers named Chino & Slack. It said "11 of 12, March 2004," which I could only assume meant that they had already been in all but one of the "Dirty Dozen," when we were still on our third. Over the years we would find some more tags by Chino & Slack, mostly in the buildings of Merchants' Row. 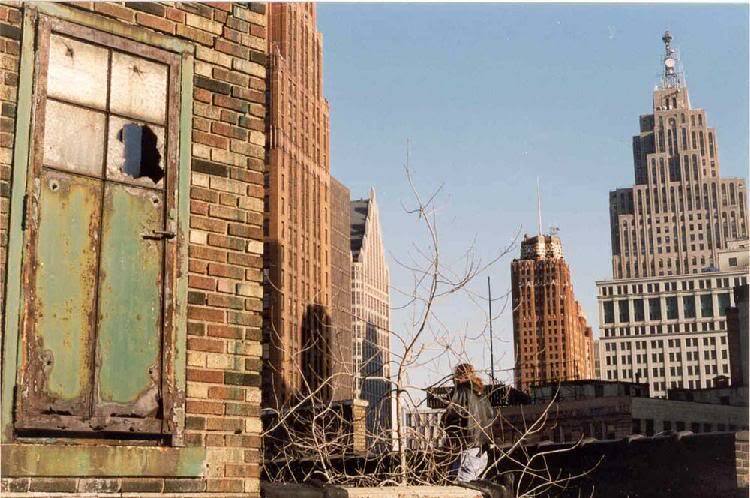 Why a race to get into buildings? 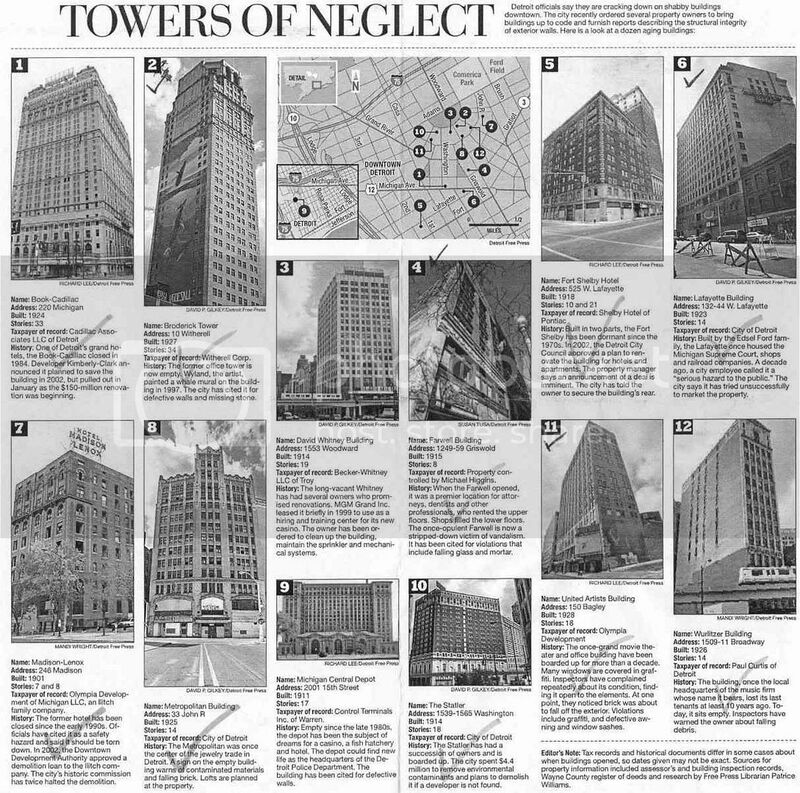 Well, it wasn't a Pokemon thing; the tenor of the Free Press article was that the list was ostensibly assembled as a means of selecting the most crucial downtown buildings in need of attention—i.e., by demolition or renovation—which meant that we'd have to hurry if we wanted to see them. 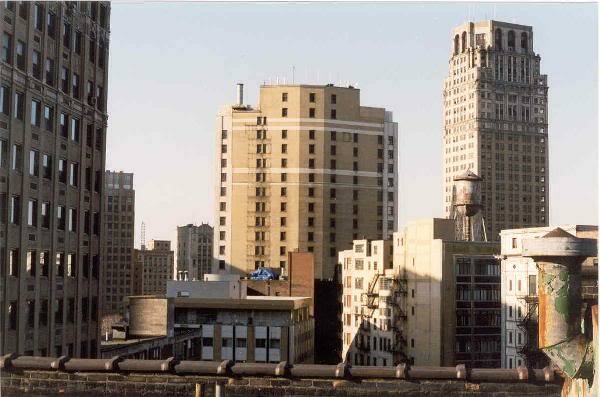 Two of them, the Statler and Madison-Lenox, were demolished shortly. 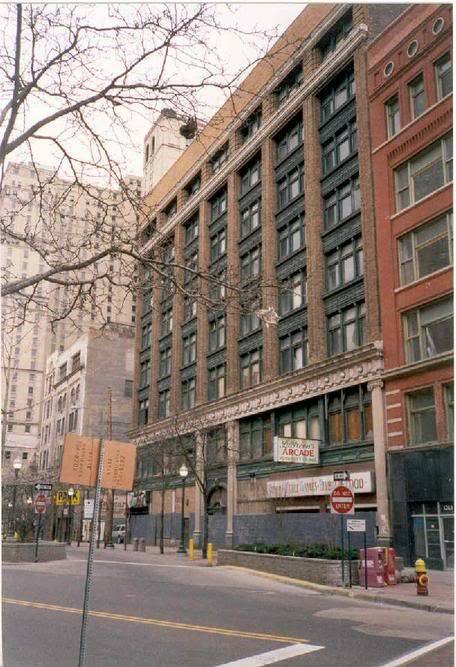 The Lafayette Building was demolished eventually, and the Book-Cadillac Hotel, Broderick Tower, Fort-Shelby Hotel, and David Whitney Building have all reopened. As of early 2015, the only members of the "Dirty Dozen" list that remain abandoned at time of writing are the Farwell itself, the Wurlitzer Building, Michigan Central Station, and Metropolitan Building. The United Artists' Building is vacant but stabilized. I am glad to say that I had the chance to see each one of the dozen in its original state before they were irrevocably altered or destroyed. Jesse Farwell himself was quite an interesting fellow and according to the great Detroit historian Clarence Burton, he "left the indelible impress of his influence upon the industrial, business, and religious history of Detroit," and "proved a force in the commercial world," yet recognized the duties that success imposes, and "ordered his course along the highest plane of honor and integrity." Fairly ringing endorsement. Farwell got his start in Detroit in 1855, partnering with Samuel Zug in the undertaking business. 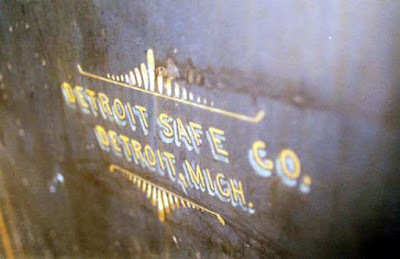 He moved on to the paving industry by 1867, was an investor in the Clough & Warren Organ & Piano Co., of Detroit, and started his own shipping fleet, the Farwell Transportation Co., in 1873, which consisted of some twenty steamers and sailing vessels. This led him into his next business venture, the contracting partnership of Collins & Farwell, which built--among many other engineering projects--the Croton Aqueduct, the Poe Lock of the Soo Locks, the tunnel under the Niagara River at Buffalo, and the first parts of the New York City Subway. He definitely seems to have had a thing for tunnels, because in 1888 he was a vocal opponent of building bridges over the Detroit and St. Clair Rivers, instead advocating for tunnels under them. Whether this was directly linked to preferences incurred from being a shipping magnate I couldn't say, but with 1888 technology any bridge spanning the wide Detroit River would undoubtedly have to have been a swing bridge. Farwell's arguments must have been persuasive, because in 1891 he was given the project lead on building the St. Clair Tunnel in Port Huron, Michigan (it is a little-known fact that another railroad tunnel underneath the Detroit River at Grosse Ile was already being attempted in the 1870s, which I talk more in-depth about in my three-post series on Stony Island). Farwell also lobbied heavily for the creation of an Atlantic-Pacific canal, and the Nicaraguan canal; the French made the first attempt in the 1880s, but the Panama Canal was not completed until after Farwell had passed away. It is interesting to note that as of early 2014, a Chinese investor was again looking to dredge a canal across Nicaragua. None of the articles I have yet seen on the topic mention that the idea was first floated in 1892 at a convention in St. Louis where Jesse Farwell was speaking on behalf of the state of Michigan. There he introduced resolutions asking President Grover Cleveland to beseech aid in the building of such a canal of all foreign nations with which America traded. 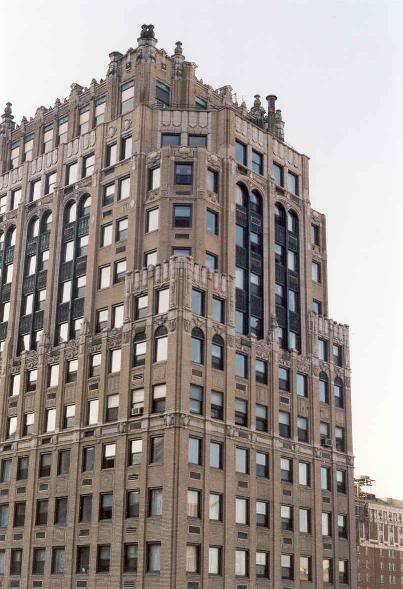 Farwell also was an organizer (and the first president) of the Detroit Evening Journal, was a real estate mogul (which undoubtedly eventually resulted in the construction of this building), and was also a trustee of the Detroit Unitarian Society. He later transferred his interest in his failing Evening Journal to Captain William Livingstone, a fellow mariner--which makes it seem like a card-table transaction, or gentlemanly parlor deal over see-gars, harumphs, and garishly swirled brandy if I ever heard one. 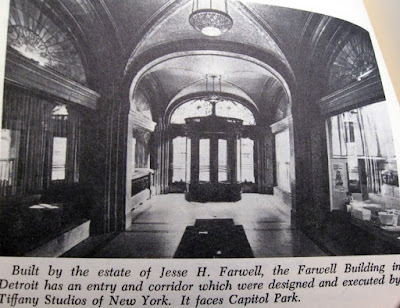 Jesse Farwell passed away in 1904, and his daughter Emma went on to marry into the Jewett family. I had a hunch that the town of Farwell, Michigan was named after him as well, but have found no proof yet. Detroitblog's old writeup stated that in early 1974 the Farwell's owner suddenly announced that "unless a buyer was found within a week," he was going to tear it down for a parking lot. Of course no offers were forthcoming, but in light of pleas by the Historic Detroit Foundation, the fact that it was listed on the Michigan Registry of Historic Sites and on the National Register of Historic Places, hearings on the matter by City Council, "and most importantly...the fact that offers from parking lot interests were too low for his liking," the owner gave up and donated the Farwell Building to the Detroit Historical Society. 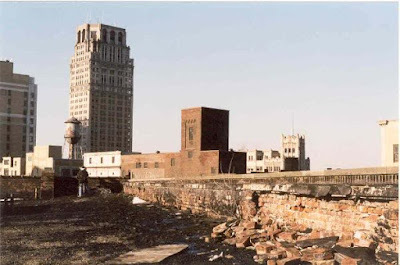 Which would explain why I found all those DHS documents in there, including a bound c.1980 redevelopment feasibility study on the Engine House of the Detroit Dry Dock Co. that I subsequently kept, and which has proved a useful reference resource. It only took another 34 years, but that building was finally "redeveloped" as of 2014, while the Farwell continues to rot. The offices featured nice walnut paneling, and in several we found a couple safes, but they were all empty. There was also a very old Stroh's bottle on a windowsill. 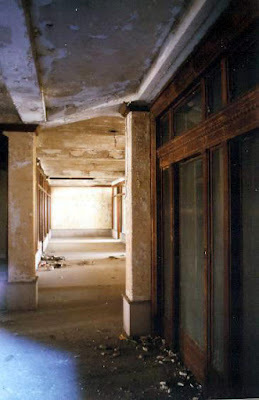 Here I noticed the work on the floor, a beautiful combination of terrazzo marble and tile insets near the edges. 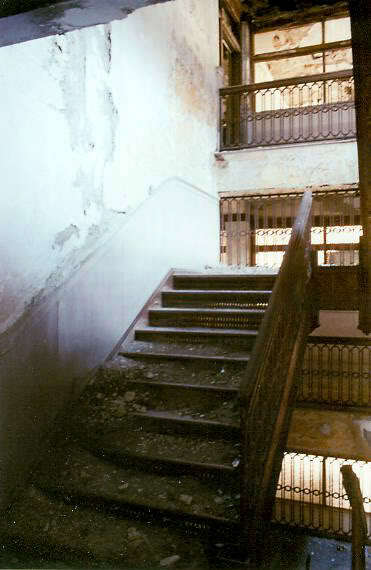 The filth factor up on the upper floors was less than down below, since the squatters usually stayed near the bottom. 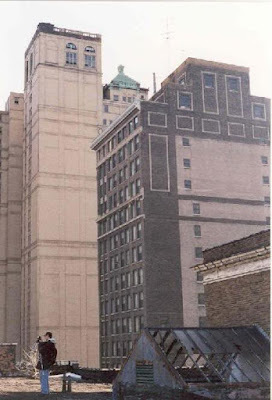 Not far away at all was Louis Kamper's Park Place Apartments, and his Book Tower, both of which were at least 50% vacant at the time. The rooftrees had begun to bud as well. 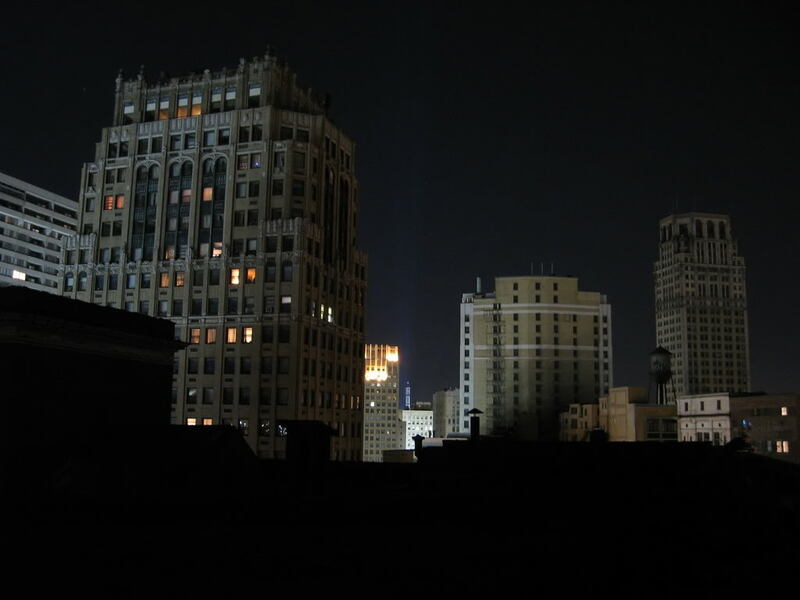 Ah, springtime in Detroit. The back alley was always a fun time, seeing as that's where I usually entered the building from. For starters there was always "something" going on, be it crack smoking, crack purchasing, urination, sleeping in someone else's urination, certain sexual transactions, dumpster diving, and of course a bunch of dorks like me trying to sneak into the eight-story abandoned Farwell Building by climbing up the back wall of the place and going up the fire escape to the open door on the second story. In fact Detroitblog wrote of one particularly annoying night that I had forgotten all about until I reread it while researching for this post, wherein he and I were delayed several times by questionable activities being conducted in said alley. It truly seemed to be the "busiest" alley downtown for many years, by my reckoning anyway, and on hectic nights like that it was as if we needed to install one of those "Take-A-Number" dispenser things on the corner, like they have at the Secretary of State's office. Please have all necessary paraphernalia in hand when you approach the counter. Anyway, it was much easier said than done, and in retrospect I wonder how many people really did it that way, besides those I went with. Scaling grime-covered walls is not in the physical repertoire of most people. This space was probably a loft, in the building's last days. I would say that I've probably made 20 or so visits to this building since 2004, several of them at night.